Because the Long Beach Grand Prix circuit is comprised of public roads, the only way to convert it into a sanctioned racing arena for two weeks out of the year is by lining the streets with large concrete barriers and catch fencing. This presents a whole series of issues for racers and drifters alike as they careen through the closed track with not only the threat of other racecars, but also the unforgiving walls awaiting their contact. 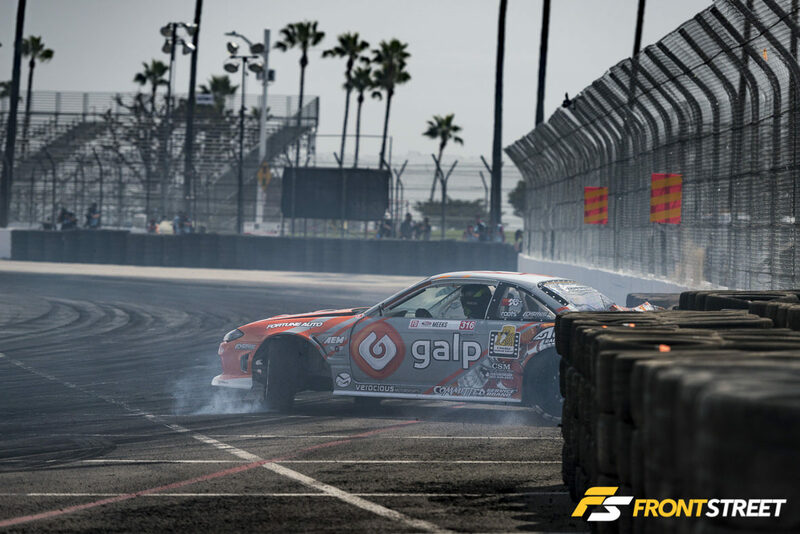 These barriers have a way of dictating the fortune of many drivers, whether it’s sucking some of FD’s most experienced veterans into its grasps, or deflecting the overzealous rookie attempts of nailing a solid run. The walls are the one constant factor that separates the unsuspecting from the prepared. Whereas most other tracks are built with some runoff area outside of corners, there is no extra room in Long Beach. This means mistakes can be costly, and an unfortunate byproduct are the massive wrecks afterward. Two rookie drivers sacrificed inch-perfect accuracy for overall speed in an effort to qualify higher up the field on Friday. Austin Meeks and his Galp Nissan 240SX got off line on his entry into turn nine, and tried to continue drifting the following corner despite this error, causing him to initiate into turn ten with far too much speed. As his rear stepped out to start the drift, it never stopped, and barged through the tire wall to make harsh impact with concrete. His team was able to fix the damage enough to get the car qualified with a 78 on his following run. Another recipient of the wall’s treatment was rookie Kevin Lawrence in his demo Enjuku Racing Nissan Skyline, after his competition car had engine issues. Perhaps due to his unfamiliarity with this other chassis, Lawrence attempted to brush the outer clipping point on turn ten with his rear bumper, instead colliding with the wall. This sent the front of his car into the wall, forcing his Skyline to scrape along the wall’s length before scrubbing enough speed to pull himself away. The car was limped back to the pits, where his team fixed the car, and he was still able to qualify in the 27th position. As a traveling media professional on the Formula Drift circuit, certain tracks offer a much closer proximity to the cars than others. This goes for general attendance proximity to the action, too. On some of the larger tracks of the FD calendar, there are too many safety measures taken in removing the bystanders from the action. For example, at Texas Motor Speedway, the track is so fearful of incident that there are only two media pits allotted to photograph from and neither is even remotely close to the corners being used. On the contrary at Long Beach, us photographers have our pick of the entire outer edge of the racetrack. While only certain areas of fence have openings for us to stick our cameras through, just bring a lens with a low aperture to blur out the fence and you’ve got your pick of any number of close angles. Some of my favorite shots are when I can see the drivers inside of their car mid-corner. There is something about the light emitted from the sun in Southern California that just shines differently from other places. Maybe it’s that the sun’s rays are stronger after passing through the depleted atmosphere above the smog stricken metropolitan city nearby, or it’s my body knowing that I’m just a few feet from the beach. Whatever the case, when cars like Kristaps Blušs’ HGK Racing “Eurofighter” BMW M3 or Fredric Aasbø’s Rockstar Energy Drink Toyota Corolla are unveiled for their maiden 2018 competition voyage they always gleam that little bit brighter in Long Beach. All other stops on the FD calendar are located on desolate racetracks far from the reaches of the general populace, in an attempt to not offend any neighboring residential or commercial areas, while the round in Long Beach is unwaveringly located in the middle of the city. This provides incredible cityscape (and palm tree) backdrops for majority of the angles, and also perfectly locks the tire smoke in throughout runs for dramatic images, before the nearby beach’s breeze clears it up again. This particular angle is one of my favorites as the smoke becomes trapped within the walls of the course, and creates the perfect tunnel to shoot photos down as the cars speed towards the rest of the corners. I say kind of, because usually my favorite part of the FD season opener is the 6 p.m. cutoff time. This positions the end of competition during the golden hour of the descending sun. Whenever presented with this opportunity, I enjoy underexposing the action in my images to broadcast only what the direct sunlight is capturing. This time was a little different however, as an immensely thick fog rolled in just as the Final Four section of competition was nearing completion. This had me worried that I wouldn’t have the chance to photograph during my coveted time period. However, cool brisk winds came through during the commercial break before the final battle of the night, turning my hands purple, and also shuffling the cloud cover and fog away from the track. This eased sunlight down onto the track in the first round of the final bout, and granted perfect lighting across Forrest Wang’s Vapetasia Nissan Silvia, as he chased his tandem competitor Fredric Aasbø in the last action of the day. After the officials directed the cars back to the center of the grandstands area to announce the winners, the pair of drivers decided to shred the remaining ounces of rubber attached to their wheels in an asthma inducing display of automotive chaos. This three-minute period between burnout and the winning announcement also yielded some of my favorite images I’ve ever taken, combining almost every element of this event into one. The overall win was given to Fredric Aasbø, who was clinical throughout the weekend in a completely new chassis. Despite his exceptionally solid return to professional competition (after a year sabbatical), which included a staggering qualifying score of 93 in the very first run of the weekend, Forrest Wang just couldn’t edge out Aasbø in the finals. Oh yeah, and a car unfortunately caught on fire, but we’re not going to discuss that. We’ll be back with more FD coverage after the Atlanta stop in May, so be on the lookout. For now, take a look through the gallery below for some more of my favorite images from this year’s season opener. Thanks for reading!